Easy UML Statechart diagramming software with rich examples and template. Edraw is ideal for software designers and software developers who need to draw UML Statechart Diagrams. UML Statechart diagram is a representation of a state machine, attached to a class or method, that describes the response of the class to outside stimuli. 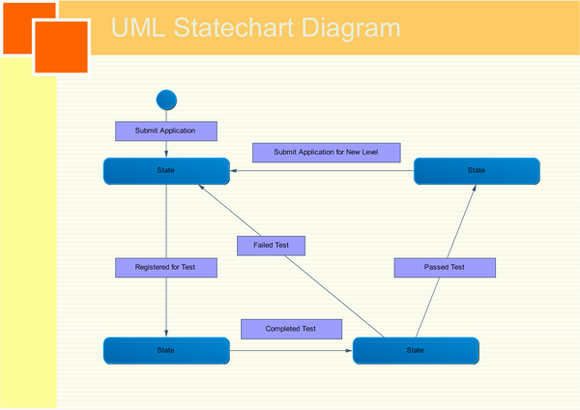 We provide a professional UML statechart diagram software with rich examples and template. Use a statechart diagram to show the sequence of states an object goes through during its life. In Edraw Professional, the UML Statechart Diagrams templates and shapes are in the Software folder. Edraw is an ideal software to draw UML statechart diagrams.